A newly renovated two bedroom apartment in Prcanj for sale with high ceilings and plenty of space inside. 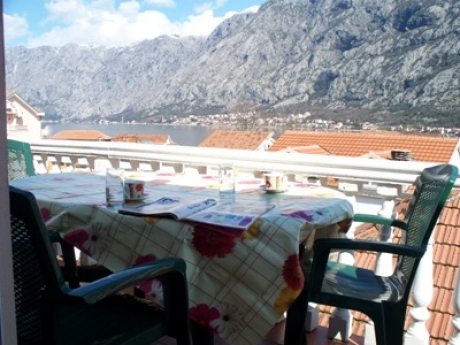 Large balcony doors and windows offer plenty of natural light and great views of Kotor Bay from a spacious balcony. This property comprises two large bedrooms, two bathrooms and a spacious open plan kitchen-diner. It's on the top (second) floor of a small block, offering total privacy. The inside floor area is 56m2, plus the 20m2 balcony. The apartment is located in a quiet area, and is only 50 meters from the sea-front, a grocery shop and two great restaurants. The village centre is 10 minute walk away and Kotor old town is 10 minute drive away. Prcanj is a well known air-spa due to the fresh and healing air coming from the forest on the hills above. It has beautiful Renaissance architecture and is only about 20 min drive away from Tivat airport. If you want your property to work for you, you can expect good income from the apartment renting. It comes fully furnished and has 2 allocated car park spaces. Price:€115000.